Today marks the five year anniversary since the release of Suzanne Collins' final Hunger Games book, Mockingjay! To celebrate, fans were encouraged to click the map of The Capitol on the all-new microsite: Squad451.TheHungerGames.movie. This website empowered them to 'tap to reveal' the exclusive new "Fallen Snow" banner for The Hunger Games: Mockingjay Part 2. Following a cumulative 11,202,015 clicks from fans around the world in just one hour, you can now view the banner and explore this vision of a toppled regime via your cursor or phone's accelerometer. We also have the banner for you to see here. With the nation of Panem in a full scale war, Katniss confronts President Snow (Donald Sutherland) in the final showdown. Teamed with a group of her closest friends - including Gale (Liam Hemsworth), Finnick (Sam Claflin), and Peeta (Josh Hutcherson) - Katniss goes off on a mission with the unit from District 13 as they risk their lives to stage an assassination attempt on President Snow who has become increasingly obsessed with destroying her. The mortal traps, enemies, and moral choices that await Katniss will challenge her more than any arena she faced in The Hunger Games. This latest poster teases the moment when Katniss and her rebels march into the Capitol to topple a giant monument to President Snow. But first, there are a few traps awaiting them, concocted by the gamemakers who devised the same sorts of death traps in the actual Hunger Games themselves. Among these traps are vats of hot oil that are poured into the courtyard. You'll notice that Peeta is back with Katniss in this sneak peek image. In the movie, he encourages her to move forward with her attack. He tells his friend that every death suffered at the hands of Snow will finally mean something, if she is able to kill this tyrannical leader. The supporting cast includes Julianne Moore (Alma Coin), Natalie Dormer (Cressida), Willow Shields (Primrose Everdeen), Stef Dawson (Annie Cresta), Evan Ross (Messalla), Patina Miller (Commander Paylor), Robert Knepper (Antonius), Gwendoline Christie (Commander Lyme), Michelle Forbes (Lt. Jackson), Mahershala Ali (Boggs) and Eugenie Bondurant (Tigris). If you weren't at SDCC earlier this month to see the latest trailer, we have that for you here too. It is a rousing teaser that will surely get you excited for this franchise ending sequel. In the teaser, we briefly see one of the more prominent cast members, the late Philip Seymour Hoffman, whose performance as Plutarch Heavensbee will be his last on-screen role. Shortly after his death last February, it was revealed that the actor will be digitally recreated for at least one pivotal scene. The Hunger Games: Mockingjay Part 1 and The Hunger Games: Mockingjay Part 2 were shot back-to-back, with production spanning from September 2013 to May 2014. 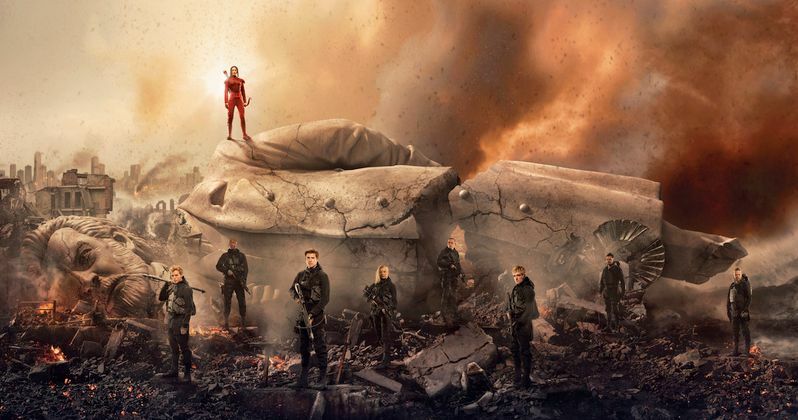 Check out the latest banner, along with the previously released footage for The Hunger Games: Mockingjay Part 2, arriving in theaters November 20. And be sure to stay tuned as we bring you more from this beloved franchise finale as we get closer and closer to the release.